In this case, the readily-available air is shoved downward by the hover motor and the skirt traps the air and keeps it inside, thus lifting the vehicle slightly. The thruster motor’s job is to propel the craft forward. Most hovercraft use either two motors (one on each side) for steering, or just one with a rudder that can deflect the flow (as your project does). The first hovercraft were thought about in the 1800s, but it wasn’t until the 1950s that real ones were first tested. Today, the military use them for patrolling hard-to-drive areas, scientists use them for swamp research studies, and businesses use them to transport toys and food across rough and icy areas. Scientists are already planning future ACVs to use magnetic levitation in addition to the air power… but it’s still on the drawing board. Are you ready to make your own? We have TWO different models to choose from. Click this link for the Easy Balloon-Powered Model, or keep reading below for the advanced version. I’ve send you a private email. So happy for you and your newborn!! Thanks for posting such a fun project! 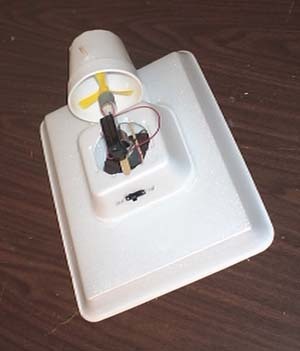 Do you have a place in your shop where you sell the parts for this Hovercraft in one package? I would be more than willing to pay for your time to gather the pieces and the postage to ship. I am at a funny stage right now (newborn and schooling lots of ages) and trying to find all the parts is posing a bit of a challenge. But your “squished” motor in the video didn’t have a gear on it. Is there any place I can get one like that? No – those are usually press-fit on, and you need a machine to get them off. However, I’ve had luck heading up the motor shaft (get an adult to do this for you) and then quickly pressing the hot gear-shaft end into a propeller and melting the prop right onto the hot shaft. Make sure when you do this you’ve got a soft, bendy type of plastic propeller or it may not work. I got some hobby motors but they have gears Instead of a plain old shaft. Any ideas on how to get them off? 1. Put in a fresh 9V battery – does that help? 2. Remove the battery and hold it above the hovercraft in your hand, so its weight isn’t on the hovercraft any longer… does it move faster now? 3. Make sure that there are no air leaks around the perimeter of the hovercraft where it contacts the table. I noticed when I made mine from paper that it would always have air leakage problems. When I switched it out for a foam plate, those issues totally disappeared. Hope this helps! Great job! I built it but it moves forward very slowly, I don’t know if that is because I used a paper plate for the base or if I have two of the same motors? Other than that it works fine. Why do you need the shroud to be elevated? Hi Pat! The motors can both be the same – if you got the ones from the shopping list, then you should be fine. I am sorry you had so much trouble getting the items… I will put it in my notes for this project that exact foam tray measurements aren’t necessary. One kid even wrote in that he used a foam paper plate when he couldn’t find a rectangular meant tray, and it worked! I sent you an email response about propellers last week, and sent you a packet of propellers that same day via mail, so you should have it very soon! For future projects that need specialty parts like this one, you can use our master spreadsheet list here: https://www.sciencelearningspace.com/2016/08/radio-shack-component-replacements/ that show you exactly which parts and where to order them online. Does that help? We are sitting here finally with all our parts and my daughter still cannot do this. We got the two motors, but did not realize til we got into the video that the one has to be flat sided. We have spent so much time getting all the stuff together for this, including driving to several grocery stores to find the right size foam tray, leaning into the meat cases with my tape measure. After many days and miles of gathering, now we still can’t do it. I had emailed you several days ago about the propellers and had not heard back, but Crystal did send me an email and sent propellers out. Now we need to know where to get the right motor. I am so frustrated……………….please tell us where to get this motor. I’ll have my team contact you right away! Radio Shack at the moment, but we’re also putting together a new set of part numbers to replace all the Radio Shack parts, which will be available soon! If you’d like, you can send a SASE to us and we can ship these out to you for $3 per propeller, but that’s the only way we can do this as we’re not currently set up to take orders for small parts any longer. If this doesn’t work due to time, you might try a hobby store or get one of those rubber-band-powered wood balsa flyers that are only a couple of dollars and take the propeller from it. Hope this helps! I was wondering where the link is for sending the SASE to you for the propellers? Thanks. I found 2 blade 4 inch propellers on amazon, or 2 blade 75 mm propellers. Do I need 3 blade propellers? So may I suggest that you change the shopping list to match the video. I shopped for the motors and then when we watched the video we found out we didn’t have the right things. It was frustrating. A link to order the propellers would be nice also. You need the lighter one as the hovering motor… watch the video to see how these are different. Why do you say to buy 2 3V DC motors (make sure it’s a high-speed motor like this motor) in your list of things needed and then say two have two different sized motors in the video? I’ll have my team connect with you right away! I had access to the advanced hovercraft a couple of weeks ago and now I don’t. I bought all of the materials to make it but now it looks like I can’t see the video. Amazing! This exercise helps my child understand! Yup – you can still do this. Just it in to us for however many you need and we’ll help you out! I found your post about sending the SASE to you for the propellers, thanks! I am having the same problem finding 3-inch propellers. Please help! Wow. Your customer service covers my science naivete! Maybe if we do this long enough, even I (Mom) will get it! Good catch on keeping the lesson without throwing out the whole experience! I am sending you something by mail that I think you’ll find useful. Keep an eye out for it! This was frustrating. Everything seems to be working properly, but one of our styrofoam pieces is way too warped on one end. I think we need a smaller straw for the rudder–more like a stirring stick? My kids also learned not to substitute tape when you say glue. I had to rip half of it apart to get to the motor underneath that was taped onto the skewers. Valuable lesson in following directions, I’d say. Help – I cannot find 3 inch propellers anywhere!! Can you send me a link where I can order a few. We have everything else but are waiting on the propellers. What happens if you reload the page, or try a different computer? The video wont play! I am connected to the internet and everything but its not working. It just keeps loading and loading ad infinitum. Let’s check a few things first: does it hover? It sounds like it does if it’s slowly spinning in a circle. Get down and put your eyes right at the level of the bottom edge of the big tray and see if there’s a gap between the tray and the table (or floor). If there is, there’s an air leak and you need to sand the edges down a little more so there’s no gap at all, all the way around. If it spins in a circle, that’s usually because it is dragging a corner or the batteries aren’t very fresh. You mentioned holding the battery and it did the same thing – my guess is that the batteries you are using aren’t at their full charge, since when you hold them, this usually lightens up the load considerably, and it usually will zoom off as soon as you do this. Let me know how it goes… and keep trying! I know you can do it! I have hooked it up from the kit. It doesn’t do anything except slowly turn in a circle. I have checked the motor directions and they are correct I think. I have tried several cup configurations over the propeller but with no success. I even tried holding the battery and it did the same thing. I sanded the edges and corners quite a bit and they look pretty smooth. Any Ideas? The materials for this project are included in the Science Mastery program. How do I get the kit???????????????????????????????????????????????????????????????????? You’re welcome! 🙂 Happy to help make your life easier so you can do more cool stuff with your kids…like science experiments! Thank you SO MUCH for the written directions! We watched the video all the way through, but I think it will be handy to have the directions right by us in the kitchen for quick reference while we are doing it. Have a great day! We’ve never had written directions for the hovercraft since it’s such a complicated project, but I went ahead and posted them for you with the experiment since you asked. You’ll want to refer to the video for the steps, since the video is going to be a lot more clear when building your project. Hope this helps! Are there written directions for this experiment? I have the Diamond Mastery Program (and Love it), but I don’t see written directions for the hovercraft. Are they here and printable? Thanks! No i didn’t know about the offer to subscribers. They sell on ebay from China. Not so great, but they say 7-14day shipping. $3.79 for 2 propellers, which includes shipping. These have 3 blades and a 2mm shaft, which I think is the same as the DC motor recommended. And 80mm diameter, which is a little over 4″ Will this work Aurora? Having the hardest time finding the 3″ diameter propellers….also the foam meat tray. If anyone has a link for where to buy, please share. Don’t worry: I am getting SILVER!!!! Sounds like a DPDT switch. Just use the three that are all in a row on one side and ignore the rest. We got a switch from Radio Shack and only now see that it has (3) pairs of tabs. Any idea which to connect? i almost have it all put together but when i wired it up only one of the motors turns. is there anything i can do to get them both turning?? You want to choose something that is easy to work with and very lightweight. Since foam is both these things and cheap, it’s the one I recommend… but do let me know what else you find that works! I want to know if there is an alternative to foam cups, hamburger boxes, and meat trays. Can we use plastic, or something else? Or we have to use foam? I think about a hundred years ago, one of the people that worked for the patent office said that everything that could be invented already was… boy was he wrong! 🙂 That was before jet aircraft, computers, and cell phones. My point is, he discouraged a lot of people who chose to listen to him. You have everything you need right now, believe it or not. You don’t have to find the cure for cancer to make an impact on someone’s life. For every hundred ideas that don’t work or no one ever finds out about, you’ll get one or two gems. The best scientists are the ones that do science because they have a passion for it, a love of learning, and an insatiable curiosity. And they know their outcome and don’t lose sight of their goal, no matter how rough it gets. You’ll figure out how to get there if your reasons for wanting your goal are strong enough. Think about it this way: most kids can walk, not because they studied walking from a book or thought about it really hard about it while sitting around. They did it because they knew they wanted to – they had a clear vision in mind and worked at it, trying different things (some of which didn’t work), until they finally figured out how to do it. The result is that most people on the planet can walk. There’s no difference between babies learning how to walk and what you’re asking about. All you need is a clear vision and a driving purpose, and you’ll figure out a way to do it. You will realize who you are along the way, knowing that you’re constantly changing and growing as you go. I choose goals for myself not based on what I think the goal will give me, but who I will become in the process. I don’t know if this makes sense, but I hope it helps a little. Looks good for a title, but you might want to try: “An ACV” so it reads easier. Or you can try a different subtitle, since most people don’t know what ACV stands for, so you might have to get creative, like: “Hovercraft: Riding on a Cushion of Air” or “Hovercraft: Floating through all Seasons”… you get the idea. 🙂 Keep up the great work! Aurora, I want to be someone famous when i get older. I want to make something that people will use and like. But I don’t know what has not been created. I’m kinda like the guy on cloudy with a chance of meatballs. Its not really because i want to be famous but…… I want to be more than just me. A ACV that can be used for all seasons. Tell me what you think please. Cool! Nice work! Most students would have given up, but you not only got to finish a really cool project, but I am guessing you also sharpened your resilience and troubleshooting skills along the way… an added bonus, which will also make your next science project go all the more smoothly. Send me an image (via email) and I’ll post it to the site so everyone can see your project! It looks fine, although these are more expensive than the ones from Radio Shack I think. I found the propellers, switch, motors and battery clip parts on Amazon if anyone is still looking. Is this motor ok? Can I use two of them and be fine? I found the propellers, switch, motors and battery clip parts on Amazon if anyone is still looking. Right – you can use anything that’s lightweight to support the motor. Does that help? A skewer? The bottom of the hovercraft is made out of foam if you’re using it on land, or that gray foam tubing if you’re making it to work on water. Plastic is a lot heavier (and louder) than foam, but I’ll bet you can still get it working. Did you notice how the battery sits on top? What happens if you remove the battery and hold it? Does it hover now? You might need longer wires attached to make it work right with this modification, but this will decrease your weight significantly. Let me know how it goes!